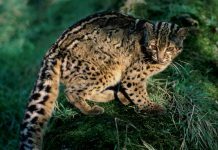 Here is a list of critically endangered animals in India and this does not limited to land animals only, there are several marine species that are undergoing rapid population decline. Some of the foremost reasons for the decline is widespread hunting, overfishing, and pollution. 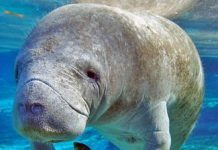 Let’s take a look at these critically endangered animals. The Sumatran rhino belongs to the family of Rhinocerotidae and is one of the five extant rhino species. 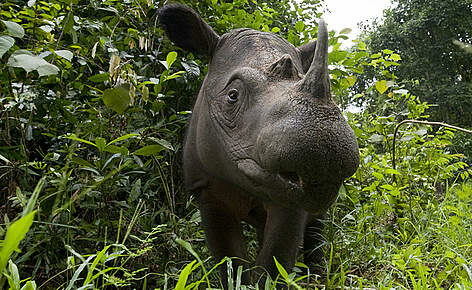 Of all the rhinoceros family, Sumatran rhino is the smallest member. The shoulder height of Sumatran rhino measures around 112 – 145 cm (3.67 – 4.76 feet), with the length measuring at 2.36 – 3.18 meters (7.7 – 10.4 feet) excluding tail. 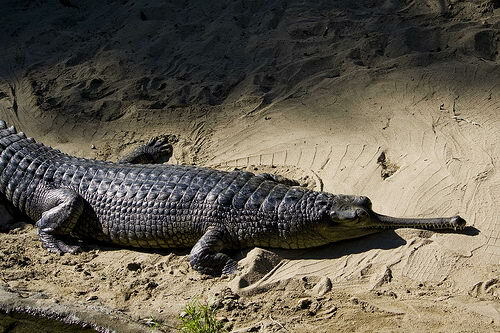 They have a tail measuring up to 35 – 70 cm (14 – 28 inches). 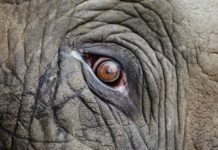 The weight of these species measure around 500 – 1,000 kg (1,100 – 2,200 lb), along with the mean weight measuring at 700 – 800 kg (1,500 – 1,800 lb), the heaviest measured at 2,000 kg (4,400 lb). The Sumatran rhinoceros, like other rhinos, display two horns that typically measures at 15 – 25 cm (5.9 – 9.8 inches). The Sumatran rhinos once lived in the swamps, cloud forests, and tropical rainforests in Bhutan, India, Myanmar, Laos, Thailand, Indonesia, China, and Bangladesh. 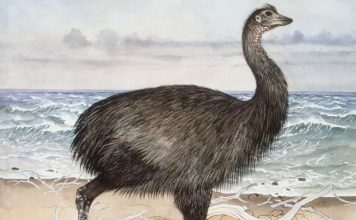 In the primitive times, these animals dwelled in the southwest China. Unfortunately they are now critically endangered species as no more than 275 individuals are left in the wild. The Sumatran rhino is mostly a solitary species except for the courtship and offspring-rearing. The hawksbill sea turtle belongs to the family of Cheloniidae and is critically endangered species. These turtles inhabit all throughout the Pacific range and are also found in Atlantic and indo-pacific regions. 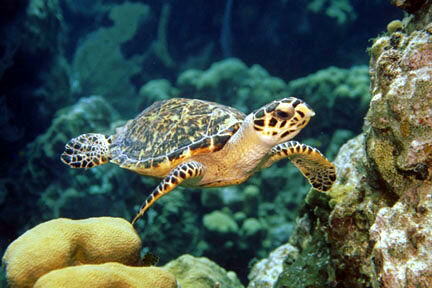 The hawksbill sea turtles look very much similar to that of aquatic turtles. 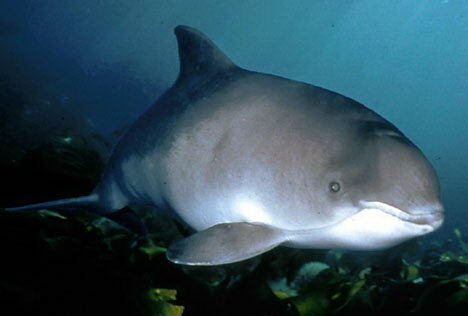 In general, they have horizontal body together with flipper-like arms that supports them for swimming. Depending entirely on the water temperature, the hawksbill shells fairly change their colors. They spend most of their time in shallow lagoons and coral reefs. On the negative side, the population of these turtles faced drastic decline thus making them endangered species. Human fishing practices are mainly responsible for this much reduction. The Ganges shark is a rare species of requiem shark that is native to the Ganges River of India. However, since bull shark and Ganges shark dwells in the Ganges River, Ganges sharks are also referred to as bull shark which is incorrect. Ganges shark is characterized by its wide rounded and small eyes. These shark species display gray-brownish color, lacking marked pattern. True to its name, Ganges shark inhabit in the waters of western and northeastern India; West Bengal Ganges Brahmaputra, Hooghly River, Bihar, Orissa, Assam, and Mahanadi in particular. These sharks are only found in inshore marine, freshwater, and estuarine systems. The length of the Ganges shark is 55 – 60 cm at birth with the maximum length it reaches is 2 meters (6.6 feet). 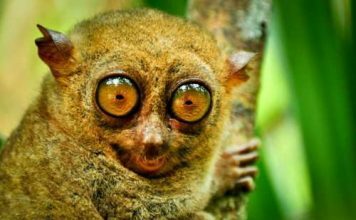 They are classified as highly endangered species by the IUCN. Widespread overfishing and hunting makes these fish at the verge of extinction. The Asiatic lion also called Indian Lion, is a subspecies of a lion. 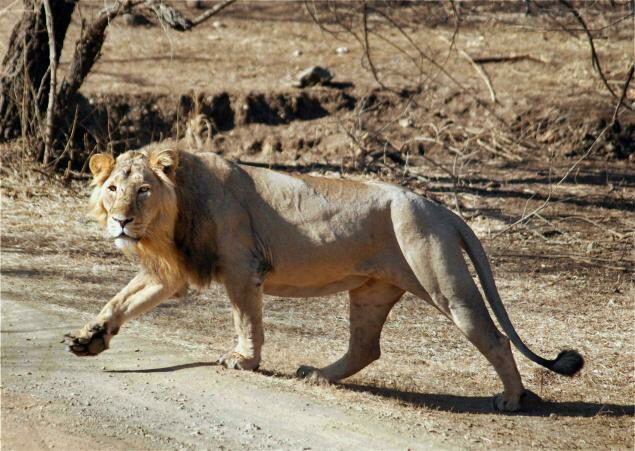 These lions are usually found in the Gir Forests of Gujarat (India). Asiatic lions are placed amongst the five major extant cats in India such as clouded leopard, tiger, snow leopard, and Bengal tiger. These lions inhabit all along the northeast Indian Subcontinent. The adult males reach a length of 2.92 meters (115 inches) and this length extends up to the tip of its tail. 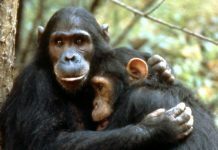 The weight of these species is up to 160 – 200 kg (350 – 440 lb) in males, while females weigh around 110 – 120 kg (240 – 260 lb). The longest Asiatic lion ever recorded was at 292 cm (115 inches), with the maximum shoulder height is up to 107 cm (42 inches). Asiatic lions are considered to be highly social animals and they tend to live in smaller groups. They primarily prey on antelope, wild boar, sambar, chital, water buffalo, and chinkara. The sei whale is a baleen whale and is being the third-largest rorqual that comes after the blue whale and fin whale. Sei whale is known to occupy almost all the major oceans including deep offshore water except in Polar Regions and tropical waters. These animals migrate each year from cool waters to the moderate or subtropical waters in summer. They reach a length of around 19.5 meters (64 feet), with the weight measures at 28 tonnes (28 short tons). The sei whale consumes as much as 900 kg (2,000 lb). The sei whale preys on krill, zooplankton, copepods, and cetaceans. 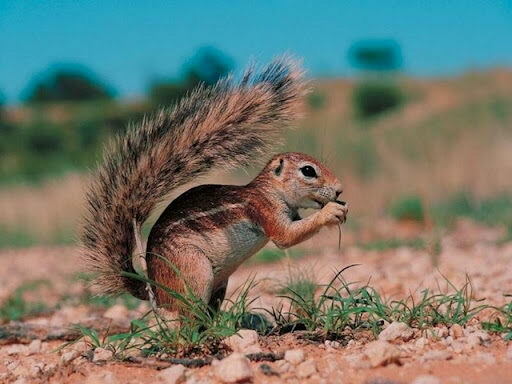 They are capable to reach a speed of about 50 km/h (31 mph) through in short bursts. 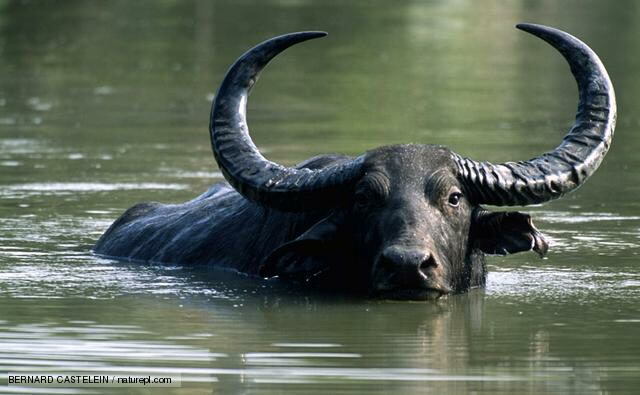 The wild water buffalo also known as Asian Buffalo, is a large bovine endemic to the Southeast Asia. 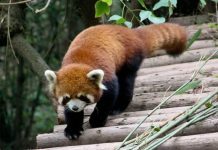 These animals are regarded as highly endangered species by the IUCN. There are no more than 4,000 individuals left in the wild, amongst which 3,100 lives in Assam, India. These buffaloes are the second largest bovid that comes after the gaur. The African buffalo is closely associated with the water buffalo. These buffaloes weigh as much as 700 – 1,200 kg (1,500 – 2,600 lb). 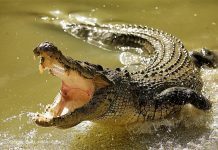 They can reach a length of 240 – 300 cm (94 – 120 inches), with a tail measuring at 60 – 100 cm (24 – 39 inches). Wild water buffalo measures around 150 – 190 cm in shoulder height.